La Petite Colombe Restaurant recently opened its doors at the newly renovated Le Quartier Francais Hotel in Franschhoek. Franschhoek, the world renowned and picturesque wine and food capital of South Africa, is abuzz with the recent opening of the iconic La Colombe’s new La Petite Colombe, which replaced The Tasting Room Restaurant at Le Quartier Francais in Franschhoek. La Petite Colombe Restaurant is an exciting new partnership with the owners of the stylish and luxurious Leeu Collection. Proprietor chefs and business partner, Scot Kirton (Eat Out Chef of the Year 2015) and Head Chef, James Gaag, will be directing a highly talented and select team, to honour the heritage of this fine venue, and marry it with the La Colombe magic. The Franschhoek Kitchen will be headed up by the talented, young La Colombe chef, John Norris-Rogers, who will be working side by side with Scot and James. The doors are open to La Petite Colombe’s striking new interior, styled by architect Rohan Young and the Leeu Collection’s interior designer, Beverly Boswell. The interior is classic, with a modern-country accent. The innovative 8 and 12-course tasting menu’s will welcome guests with a stylish and flavour familiarity to that of the award-winning La Colombe restaurant in Constantia, focusing on the finest local and seasonal produce and recommended with a rare and fine wine selection. Sweet potato baguette, whipped pork fat with lemon and herb crumb. 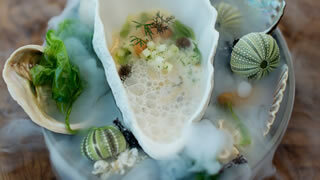 Poached West Coast oyster, Champagne verjuice, dill and sago. Asian style tuna, aubergine, miso and avocado. Barbeque quail, scallop, mussels, bokchoi and corn. Asiago, pear, pecan, Japanese Cheese cake.